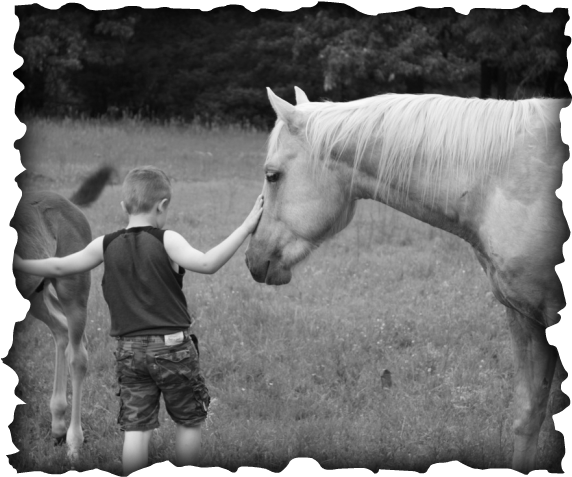 In the pasture with the mares he was breeding and their foals...Our son needed to pet Leo and Rico at the same time. Pepsis Lil Playgun "Rico" has his father's demeanor and the mind of a seasoned older horse at a young age. He is so willing to please, is constantly paying attention to you commands, and demonstrates his beautiful mind and agility on a daily basis. His mother was an own daughter of Playgun out of Docs Matodora. She was a broodmare only and sold for $7500. He has cutting pedigree, ranch heritage, and some running blood all wrapped in one HANDSOME package! *Booking fee is non-refundable and will be applied towards breeding fee. **Mare care rates vary depending on hay availability, cost of feed, etc. Contact us for inquiry on mare care prices. ALL BREEDING WILL BE LIVE COVER OR PASTURE BREEDING ONLY AT THIS TIME! Like us on ﻿﻿﻿﻿﻿﻿﻿﻿﻿Facebook﻿﻿﻿﻿﻿﻿﻿﻿﻿ to keep up with this handsome man! ​His sire is Hairpin Pepsi San "Pepsi"! Rico's dam, Annas Lil Playgun, half sister to Annadora Merda (NCHA $25K+), World Show Qualifier in Sr. Cutting. MC Hiada (NRHA $3K+, NRCHA money erner)etc. Maternal grand dam was Docs Matodora (producer of Smooth Lil Anna ranked 9th in the $15,000 Novice Horse category with Longhorn Cutting Horse in March of 2014). Annas lil Playgun is an own daughter of Playgun. Like his ﻿﻿﻿﻿﻿﻿﻿﻿﻿Facebook﻿﻿﻿﻿﻿﻿﻿﻿﻿ page to keep up with this handsome man! He is 5 panel negative and negative for the Agouti gene. His colts will be eligible to show at PHBA shows. ​Rico did not qualify to become registered with this association. The association determined he was only 82.83% foundation bred, but according to NFQHA if he is bred to a mare measured 88%+ the colt will be eligible for NFQHA registration. ​Rico does not have the credentials to become a registered paint, but he is registered as a breeding stallion.